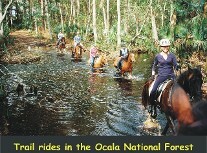 Located in Central Florida's Lake County at the southern edge of the Ocala National Forest, KH Ranch Resort offers accomodations for guests, riders and pastures for horses on a 48 acres-ranch with private forest and lake. Our accomodations are in a newly renovated 3,225 sq.ft. triplex ranch house, located in a ca. 150 year old live oak grove and with lake view. We also offer 2 RV or trailer sites with electricity and water. For your horse(s) an about 1 acre pasture as well as a paddock (~120' x 35') are available, both next to the ranch house or your RV / Trailer and with tree-shaded areas, electricity and water troughs. 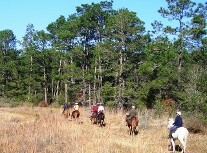 Saddle up at the pasture's hitching post and ride 10 min (~0.6 miles) on easements right into the Ocala National Forest with more than 200 miles of trails for horseback riding. After the ride relax at the resort's screened-in pool (40' x 16') or around the campfire. If you do not ride horses, KH Ranch Resort offers you a retreat into the tranquility of rural Florida with many other recreational activities like hiking, swimming, kayaking etc.